In 2002, public concern was raised over reported high levels of methylmercury in commercial fisheries in the Gulf of Mexico, and attention was drawn toward the operation of oil and gas rigs as a possible contributing mercury source. Methylmercury is the most toxic and bioaccumulative form of mercury found in the environment, and although a great deal has been learned about the sources and fate of methylmercury in freshwater systems, comparatively little is known about estuarine and marine systems. Structure and process to address mercury issues in the Gulf of Mexico region. This issue is particularly important for this region because fish consumption rates are higher than the consumption rates for average Americans. The report will help policy makers make better decisions concerning this sensitive issue. 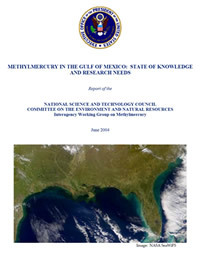 Interagency Working Group on Methylmercury, 2004, Methylmercury in the Gulf of Mexico: State of Knowledge and Research Needs: National Science and Technology Council, 21 p.
Mercury-Contaminated Fish--Is it Old or New Mercury? How Reliable are Chemical Property Data in the Literature?